It’s okay if you feel daunted when you first look at Royal Purple’s massive range of engine oils. They have so many different types, you can be forgiven for feeling confused about the one that’s right for your car. As it happens, though, the multitude of different oil types will actually make things simpler for you, as it allows you to pick out the type that perfectly suits your desired application. What Kind of Oil Do You Need? Ultimately, it depends on what kind of vehicle you drive. The type of oil your engine needs to stay lubricated can differ immensely based on what kind of engine it is and how it’s being used. A NASCAR driver will need a totally different kind of oil from an everyday driver dropping their kids of at school then heading off on the daily commute. Makes sense, right? 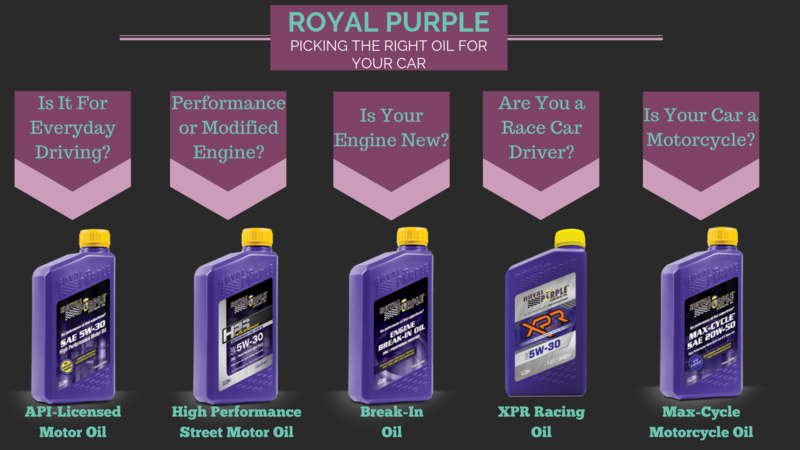 For everyday driving, you’ll want to use Royal Purple’s API-licensed motor oil. This motor oil combines premium base oils with Royal Purple’s proprietary blend of additives, offering a high-performance synthetic oil for the average driver. This is the right choice for anyone who wants to look after their day-to-day engine, ensuring better performance while also minimising deposits and the chance of breakdown. If your car’s sporting a high-performance or modified engine under the hood, then the HPS Series is for you. This High-Performance Street Motor Synthetic Oil is designed to maximise the performance of your engine. It features a high level of zinc/phosphorous additives to guard against wear and responds to increased pressure with increased viscosity. New engines can sometimes struggle with conventional motor oils. If you want to ensure that your engine performs as well as it can from the first time you turn it over, then start it off on Royal Purple’s innovative Break-In Oil. This fully formulated oil boasts a special blend of additives designed to provide a high degree of protection for new engines, particularly flat-tappet and roller engines. For any kind of racing vehicle, you’re going to want to pick XPR – Extreme-Performance Racing Oil. This motor oil is carefully formulated for the demands of multi-platform racing, and is popular among drivers and crews in a huge range of motorsports such as NASCAR, NHRA, World of Outlaws, and Bonneville Salt Flats. Lastly – if you’re a motorcyclist, Royal Purple has designed an engine oil specifically to protect your machine. Max Cycle Synthetic Oil is designed to provide improved film strength, shear stability, and oxidisation resistance, protecting highly stressed bike engines and transmissions. All of Royal Purple’s engine oils are synthetic – and that’s a good thing! Synthetic oils are made from mineral oils, but distilled down to their basic molecular form. This process removes impurities, which results in a number of benefits for your engine, including increased lubrication, a lower chance of breakdown, and improved stability. Plus, the fact that all those impurities have been removed means that these oils will lead to fewer deposits in your engine, ultimately improving your vehicle’s performance and bolstering the lifespan of the engine. If you’re worried about upgrading from mineral oil to synthetic, then worry no longer. Royal Purple’s synthetic oils have been designed with the driver’s convenience in mind – they are all compatible with mineral oil as well as other synthetic oils. This means that you can make the switch as soon as you’re ready.